Christianity arrived in China by way of Syria in the 600s. Depending on China's relations with the outside world, Christianity over the centuries was free to grow or was forced to operate secretly. The 120 martyrs in this group died between 1648 and 1930. Most of them (87) were born in China and were children, parents, catechists or laborers, ranging from nine years of age to 72. This group includes four Chinese diocesan priests. The 33 foreign-born martyrs were mostly priests or women religious, especially from the Order of Preachers, the Paris Foreign Mission Society, the Friars Minor, Jesuits, Salesians and Franciscan Missionaries of Mary. Augustine Zhao Rong was a Chinese solider who accompanied Bishop John Gabriel Taurin Dufresse (Paris Foreign Mission Society) to his martyrdom in Beijing. Augustine was baptized and not long after was ordained as a diocesan priest. He was martyred in 1815. Beatified in groups at various times, these 120 martyrs were canonized in Rome on October 1, 2000. The People's Republic of China and the Roman Catholic Church each have well over a billion members, but there are over 12 million Catholics in China. The reasons for that are better explained by historical conflicts than by a wholesale rejection of the Good News of Jesus Christ. 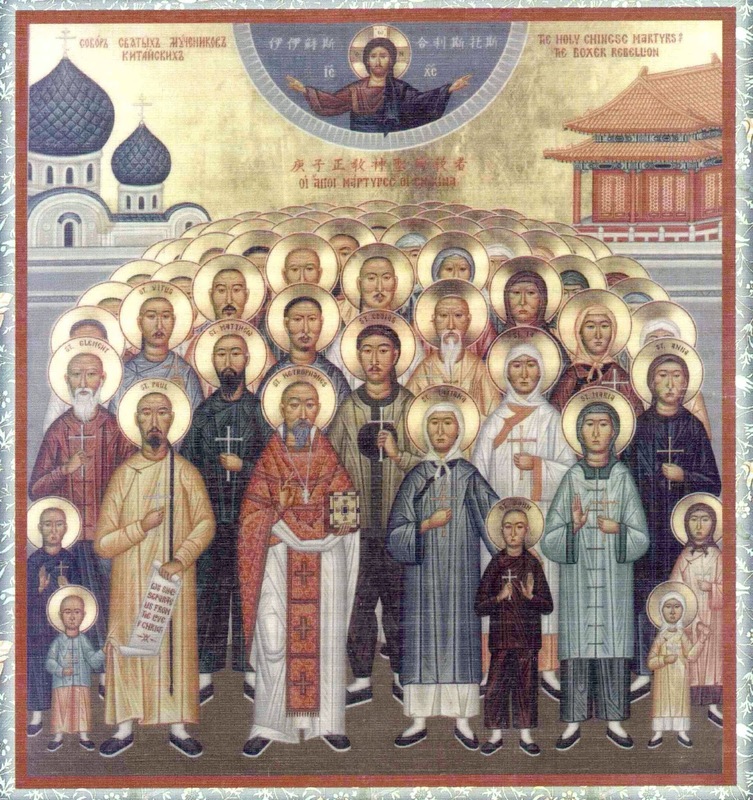 The Chinese-born martyrs honored by today's feast were regarded by their persecutors as dangerous because they were considered allies of enemy, Catholic countries. The martyrs born outside China often tried to distance themselves from European political struggles relating to China, but their persecutors saw them as Westerners and therefore, by definition, anti-Chinese.The Good News of Jesus Christ is intended to benefit all peoples; today's martyrs knew that. May 21st-century Christians live in such a way that Chinese women and men will be attracted to hear that Good News and embrace it. A year after these martyrs were canonized, Saint John Paul II addressed a group of Chinese and Western scholars, gathered in Rome for a symposium honoring the 400th anniversary of the arrival in Beijing of Matteo Ricci, a Jesuit scholar and Chinese intellectual. After noting the positive contributions that Christianity had made to China, especially in health care and education, Pope John Paul II continued: "History, however, reminds us of the unfortunate fact that the work of members of the church in China was not always without error, the bitter fruit of their personal limitations and of the limits of their action. Moreover, their action was often conditioned by difficult situations connected with complex historical events and conflicting political interests. Nor were theological disputes lacking, which caused bad feelings and created serious difficulties in preaching the Gospel…. "I feel deep sadness for these errors and limits of the past, and I regret that in many people these failings may have given the impression of a lack of respect and esteem for the Chinese people on the part of the Catholic Church, making them feel that the church was motivated by feelings of hostility toward China. For all of this I ask the forgiveness and understanding of those who may have felt hurt in some way by such actions on the part of Christians."